Nottingham Trent University’s Food Industry Technical Professional Degree Apprenticeship has been designed in conjunction with the food and drink manufacturing industry. Degree Apprenticeships help employers to grow their own talent and nurture the employees who will go on to play a key role in their business. For many employers it provides an alternative option to graduate recruitment. Employees get the opportunity to gain a degree in BSc (Hons) Food Science and Technology, with the addition of hands-on experience gained through work. In such a fast moving industry there are excellent opportunities for career progression in this sector while at the same time there is also a real need for employees to be trained to degree level (classed as higher education). Apprenticeships can offer the best of both worlds. Structured, quality assured education alongside practical on the job learning that benefits both the employer and the employee. Companies are recognising the benefit of investing in the development of their workforce and are prepared to take on Apprentices safe in the knowledge they will be gaining the skills and knowledge that will benefit their business. The Degree Apprenticeship is equivalent to the first steps on the Higher Education ladder, and is aimed at applicants, aged 18 and over, interested in developing a scientific or technical career. Some Apprentices start in entry level roles whilst others are more experienced staff perhaps without formal qualifications in the field. Usually their career and responsibilities progress throughout the duration of the programme. It is ideal for those in roles covering quality assurance, technical, production and new product development. The block study approach allows you to combine studies with work and apply what you learn at University to the workplace. How is the degree apprenticeship course run? 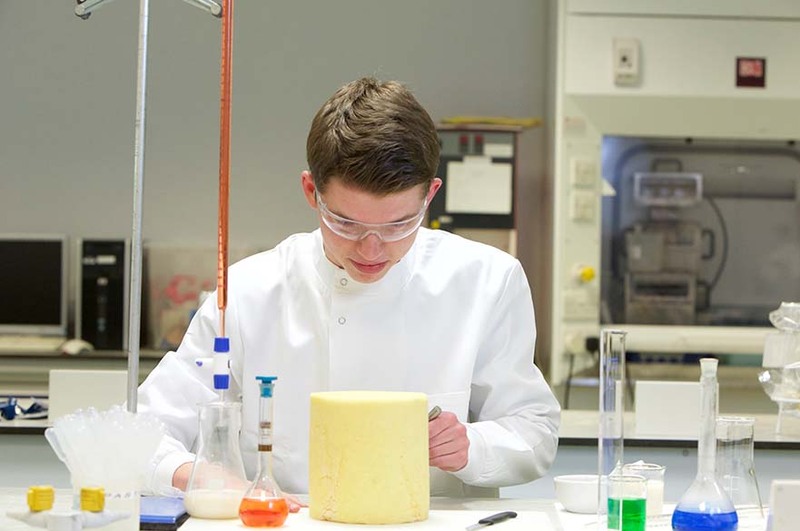 The Degree Apprenticeship is a four year programme which leads to a full BSc (Hons) in Food Science and Technology. We can guide you through the complexities of applying, employer commitments and fees and funding. Get in touch to find out how to get started. You will experience a range of learning and teaching methods. As well as traditional lectures and tutorials you will undertake practical work in our food processing laboratory and chemistry laboratory. Visits to commercial businesses are also arranged. Course material will also be delivered by online learning. You will be assessed through coursework (60%) and exams (40%). When are are the block study periods? The course is delivered by a combination of fourteen 5-day block study periods alongside online learning to deliver additional material. Years One and Two will each contain four study blocks and years Three and Four will each contain three study blocks. Study aspects of chemistry that are of particular relevance to food production. Carry out laboratory analysis of foodstuffs and learn the principles of data analytics. Understanding the different attributes of a range of food raw materials and evaluate how agriculture practices affect their quality. The module also covers supply chain management procedures, and how primary production is manipulated to modify characteristics of raw materials. Gain the knowledge and skills to implement safe practices in the production of food. This module covers the professionally recognised Level 4 Food Safety syllabus. Assess the market and identify the need for a new product across different sectors of the food industry. you'll also learn about technical feasibility and cost analysis of developing a new product. Discuss the challenges, problems and benefit related to the sustainability of food production and food supply chains. You'll also identify and evaluate methods by which the environmental impact of the food industry can be minimised. Learn business and management skills and understand organisational structures within the food industry. Understand human nutrition and develop an ability to analyse foods for macronutrients associated with nutrition and allergens. You'll also investigate how consumer needs affect product development. Gain a sound understanding of processing operations used in the food industry, including mixing and emulsifying , filtration, heat-processing methods and dehydration. Carry out an individual work-based study project on a topic approved by the University and your employer. Consider the stages involved in the development of a new food product from specification design and cost analysis through to packaging, labelling and marketing. Understand the various constraints within which new food product development takes place. This module will broaden your understanding of a range of food processing technologies, including membrane processes, high pressure processing and freezing, chilling and controlled atmosphere preservation. You will also learn about the scientific principles underpinning these technologies and their impact on food production, quality and safety. This module fulfils the Apprenticeship requirement for an end point assessment. You will be required to undertake a substantial work place projects on a topic agreed upon by you, the University and your employer. You will also undergo a technical interview which will test your competence as a food industry technical professional. This qualification will assist your career progression within the food and drink sector. They are appropriate for a range of roles including quality assurance, technical, production and new product development. 104 UCAS Tariff points from three A-levels or equivalent qualifications, including an A-level equivalent in a Science subject. You will also need GCSE Maths and English at grade C / 4. Applicants without A-levels will have their qualifications assessed for subject compatibility. Other requirements: You must be employed in the food industry under an 'Apprenticeship Agreement'. Your employers must fully support you in all aspects of your learning programme including time off to attend study sessions. Applications are also encouraged from industry professionals or mature students who may not have formal entry qualifications, but who can demonstrate commitment or have relevant experience. Your employer will be able to access government funding to help support with you with tuition fees. There is no limit to the number of funded places an employer can apply for.